During the past week or so, life has been pretty hectic. I'm talking about endless visits to the doctor, dance class, birthday parties, conference calls, edtech summits, three funerals and a wedding. If there was ever a year to cash in my Aeroplan miles, this is the one. When life has me constantly on the go, the last thing I want to worry about is running out of battery on my phone. Thankfully I have been able to rely on my trusty new compact power pack by AUKEY, the makers of this sleek wooden table lamp and this handy aromatherapy essential oil diffuser. The AUKEY 10000mAh Dual-Port Power Bank is perfect for delivering multiple charges for almost any phone. It has the capacity to fully charge an iPhone 7 3.7 times, a Galaxy S7 2 times, or a Nexus 5X 2 times. 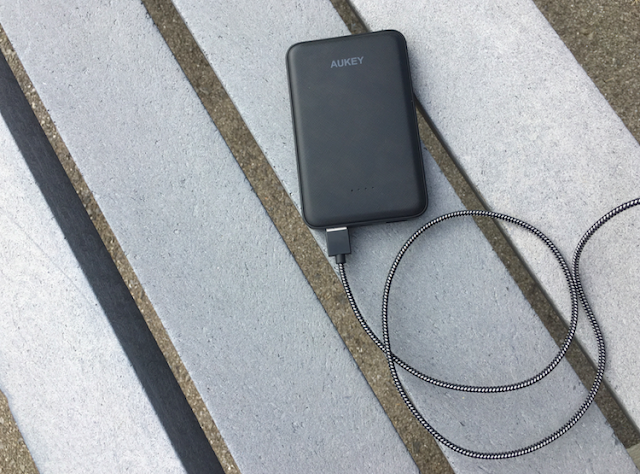 I have an iPhone 6 and I can use my AUKEY power bank to charge it 4 times! It also features dual USB ports so you can simultaneously charge two USB-powered devices (including Android and Apple). I personally love its compact design and durable, scratch-resistant case that is small enough to easily fit into my pocket or purse. The minimalist white battery level lights and subtle crisscross case texturing add a touch of elegant simplicity and style, while built-in safeguards protect your devices against excessive current, overheating, and overcharging. It also pairs quite nicely with the AUKEY Nylon Braided Lightning Cable, which you can purchase on Amazon.ca for $12.99. 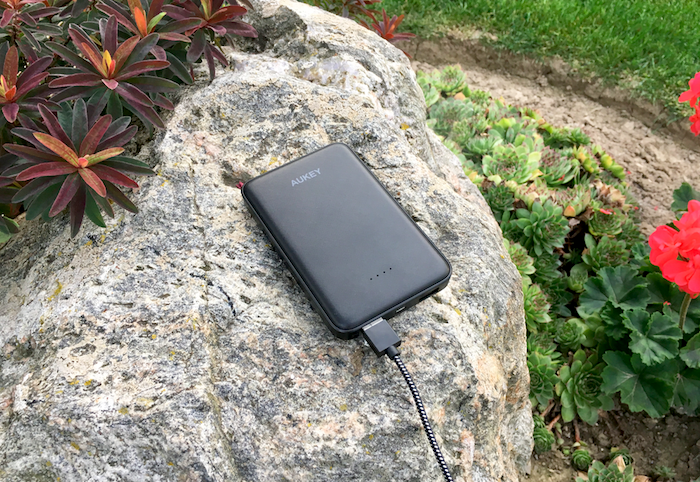 The AUKEY 10000mAh Dual-Port Power Bank is also available at Amazon.ca for $23.99, which is a bargain, and includes a Micro-USB Cable, User Manual, and a 24-Month Warranty Card. And both are eligible for free Amazon Prime shipping! Disclosure: I received product to help facilitate this review. Any opinions expressed in this post are my own. This post contains affiliate links. This would be nice to have for camping or holidays, or even for a weekend Good review, thanks!! I don't have an Aukey but a different brand, and it has saved me a few times already. I have a lot of my reward cards on my phone and when shopping my phone likes to die, but thank goodness I have my power charger on me, I love them!! We really do need a power pack. This looks like a great one I will check into more. I really need a power bank for my phone. I take so many videos of my boys all the time and my battery drains super fast. I need one of these for when I travel. My phone battery tends to drain really quickly. The power bank would be a great xmas item for my older teen! Thanks for the review, sounds like a product I need!